BetChain is an online casino that likes to bill itself as the “most lavish Bitcoin casino” on the market. They offer a large variety of quality casino games such as slots, table games and live dealer games. Licensed and regulated in Curacao by Antillephone N.V., they are owned and operated by Direx N.V. which is registered in Cyprus. BetChain was established in 2013, and their Bitcoin-centric focus continues to set them apart from their competitors. Players may play in whatever currency they prefer which is set when registering an account. The casino offers instant playing and mobile versions of their games, compatible with Android and iOS devices and uses the latest SSL 128-bit encryption technology. A reflection of their commitment to accountability, the casino uses Provably Fair which is a technology that players can use to verify that the outcome of bets is fair and correct. To bid you a warm welcome, BetChain offers a 100% welcome bonus of up to 1 BTC / €200 / ZAR 3,000 / AUD/CAD 600 + *200 free spins which is applied on your first deposit. There is also a High Roller version of the welcome bonus. If you utilise the welcome bonus, then there is a wager multiplier of 50x but remember that not all games contribute equally to satisfying the requirement. While slots count 100%, blackjack, craps, poker and dice only satisfy 5%, while roulette and baccarat do not count. There is both a maximum bet and maximum win per currency, the details of which are available on the website. *The free spins are split over 20 days, with 10 per day and also have a wager requirement of 50x. To qualify, you’ll need to make a minimum deposit which varies according to currency. There is also a maximum win from free spins which varies by currency. 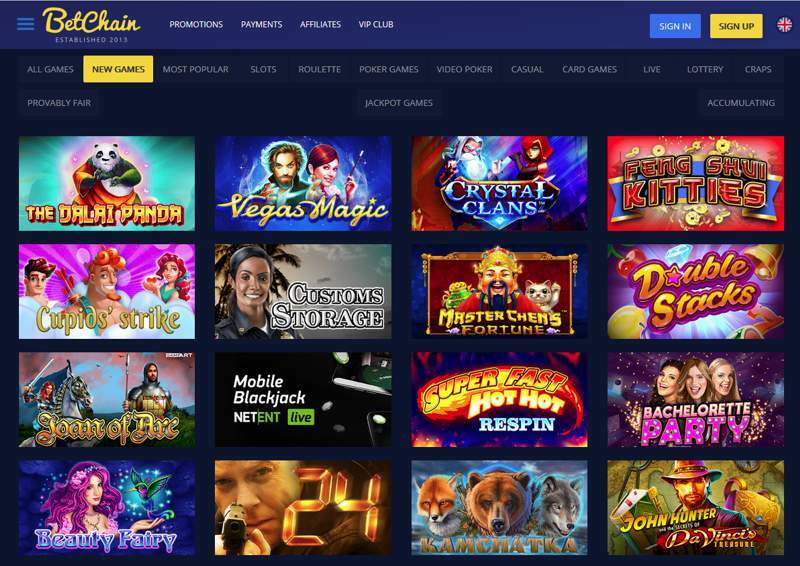 The online casino bids you a warm welcome with over 2,000 online slots, some of which include high volatility progressive jackpots such as Mega Fortune and Divine Fortune from Netent, as well as Mega Moolah from Microgaming which paid out a record €19.6m in September 2018. If you prefer low to mid volatility games, then there is a great selection of branded and unbranded slots with a range of themes and features so you’ll never get bored. Additionally, the casino offers dozens of online and live table games: roulette, poker, scratch cards, blackjack, baccarat, Keno and craps. In addition to the welcome bonus, there is also a 75% second deposit bonus, 50% third deposit bonus and 50% fourth deposit bonus. 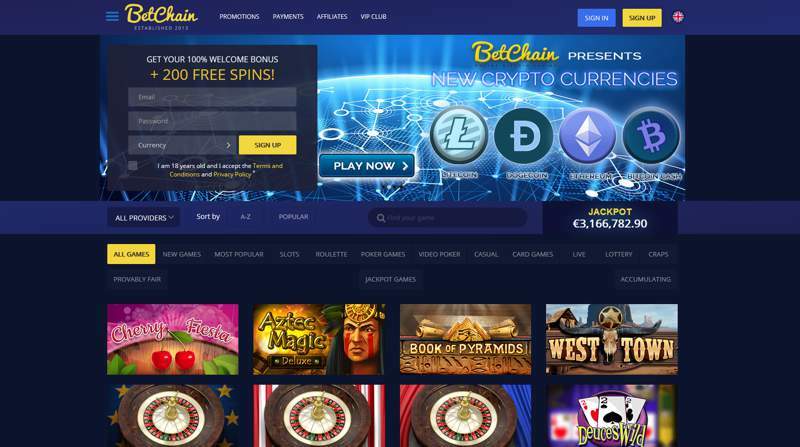 BetChain regularly offers promotions, that may change, which include 15% Cashback Tuesdays, 50% Reload Wednesdays, up to 50 free spins every Friday, Happy Hour Bonus, and monthly and weekly tournaments containing prize pools. Finally, VIP players receive special promotional offers each day of the week according to a four-tier status: silver, gold, platinum and black. Visit the promotions section of the casino to read through the terms and conditions for all bonuses. Accepted deposit methods include Bitcoin, Bitcoin Cash, Litecoin, Ethereum, Dogecoin, Visa, Mastercard, Neteller, Paysafecard, Skrill, Sofort, ecoPayz, iDebit, InstaDebit, zimpler, Yandex, Qiwi, Alfa Click and Promsvyaz. Your chosen method will determine the time it takes along with the minimum and maximum transfer limits. Accepted withdrawal methods include Bitcoin, Litecoin, Bitcoin Cash, Ethereum, Dogecoin, Visa, Mastercard, ecoPayz, Neteller, Yandex, iDebit, InstaDebit, Skrill and Qiwi. Your chosen method will also determine the time it takes along with the minimum and maximum transfer limits. BetChain customer support includes a contact form, email at [email protected] and a live chat. Unfortunately, the casino does not provide telephone contact service.